mediainspiratorium – an intermedia history 1800-2015 Media Inspiritorium is a history of the form and the content of 21st century new media, and therefor includes a history of computing and digitalisation of media, and histories of art, animation, television, film, comics, graphics, information-design, interface design, photography, motion-graphics, typography, publishing, music, multimedia, and the theories and technological and scientific innovations that underpin new media. The Media Inspiratorium will eventually be a wiki-based self-generating archive of media inspirations, creative practices relevant to the media-arts, and exemplars of media-innovation over the last 200 years. The Media Inspiratorium is based upon over 40 years of teaching art, design and film students, and realising the need for short, introductory, hopefully inspirational exposure to aspects of art and media history that seem to have been ignored in secondary (and most tertiary) educational curricula. It is a chronological catalogue of ideas, artworks, films, theories, books, and a lot more stuff that inspired me when I first experienced them. It is designed to be an educational resource, and a repository of ideas, examples and experiences in the design of software and digital content, and the creation of pre-digital multimedia or intermedia art-works. By inviting designers, developers and content creators of all persuasions to contribute their suggestions for inclusion, this resource will build into a national and international archive of resources related to media-innovation and content-creation, and is intended to be a repository of skills, heuristics, experiences, memories, advice, work-flow, methodologies, practices, tricks-of-the-trade, craft-skills and related insights. We hope it will develop into a valuable repository of creative practice, with entries from media practitioners across the wide spectrum of media now in the digital domain. If you have expertise, inside-knowledge, exemplars and inspirational examples of work in any of the following areas, we would encourage you to contact us. Use the triple-bar menu upper-right to access the timeline. Please Note: At present, this is a personal intermedia history – I attempt to trace the back-story of where we are now in the 21st century – tracking developments and innovations in all the media that comprise our digital, networked environment, and it is guided from the 1950s onwards by media and art innovations that inspired me at art school and working professionally as a lecturer, artist, designer and creative director working mostly in new digital media. It is intended to extend this archive of innovation into a collaborative wiki-based repository of creativity, where other creatives with useful insights, heuristics, knowledge and experience can input their own innovations or inspirations, or comment upon others. In this way, we may build a focused repository or catalogue of innovation, ideas-generation, entrepreneurialism, content-innovation, emerging theories, relevant science and technology (etc,etc) that is accessible by all, and that will provide a ‘knowledge-mine’ (in the expert system sense) of creative endeavour for students, and designers/innovators of all ages, whatever medium or intermedium they have chosen to work in. “Dreaming of a Fluxus magazine in 1961, George Maciunas planned to include articles on electronic music, anarchism, experimental cinema, nihilism, happenings, lettrism, sound poetry, and even painting, with specific issues of the magazine focusing on the United States, Western Europe, Eastern Europe, and Japan.” (Clive Phillpot, Stendhal Gallery). This is what attracted me to the Fluxus ‘movement’ – a loose agglomeration of the international avant garde – and to the artists associated with it. This is the aim of this Inspiritorium collection-film-exhibition-book, and of mediainspiratorium.com and mediartinnovation.com – to celebrate the flux (the fusion) of aesthetics, media, technology innovation, and the theories and scientific discoveries that underpin such innovation. Fluxus was the first art movement to celebrate precisely this fusion, and I discovered this at Portsmouth Art School, and at Hornsey College of Art, encouraged by the work and teaching of George Knox, John Bowstead, and Clive Latimer, and later reinforced by learning about the Bauhaus, Black Mountain College, Buckminster Fuller, Stewart Brand’s Whole Earth Catalog (1968) Jascia Reichardt’s Cybernetic Serendipity (1968), Michael Moorcock’s New Worlds (from c1966) and Gene Youngblood’s Expanded Cinema (1970) and later reinforced by Wired and The Edge (both appearing in 1993). This collection of the ‘new’ in media, in arts, and in media technologies, and the theories and scientific discoveries that underpin such innovation are my subject. I want to create an immersive, holistic collection of all the diverse arts that until now, have mostly been seen (and often studied) in isolation from each other, instead of in the ever-changing context of the time. I want to provide a browsable, easy-to -access resource that in exhibition mode is immersive and hopefully illuminating, that in book and ebook form is chronological and inspirational. Think of this collection as comprising all the best stuff – the stuff it would otherwise take forever to discover. Its my curatorial choice of the art and ideas that form a kind of back-story to the intermedia environment that is where we are now. 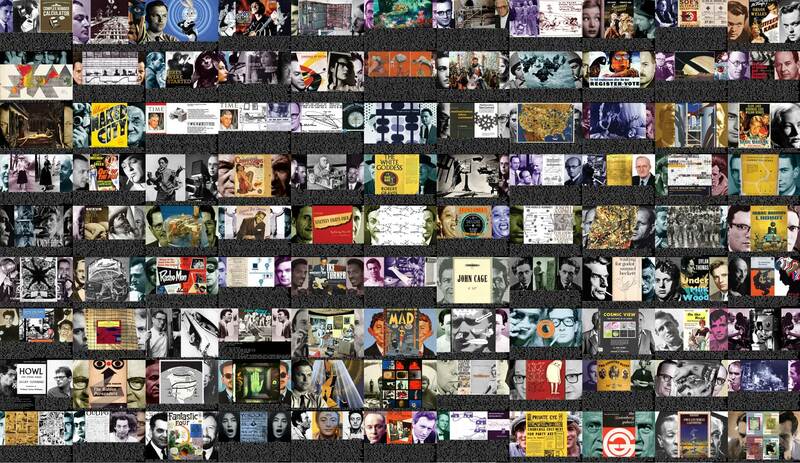 The Inspiratorium is the first intermedia history of the arts, media and innovation. It is a personal collection of innovative artefacts, drawn from the histories of all the media arts (photography, painting, installation, animation, film, graphics, performance, commercial art, music, theatre, dance, literature, poetry, fashion and costume, computer-based art, etc); from the innovations in media form and content, and from the scientific discoveries and critical theories that underpin such innovation – the emerging theories of art, photography, film, new media, etc, and the core theories of perception, colour, cognition, consciousness, psychology, physics, computer science etc.The Inspiratorium also includes the people who personify the zeitgeist of the periods covered – the artists, designers, stars, celebrities, characters, entrepreneurs and impresarios of the ages. It is designed as an exhibition to immerse, inform, guide, inspire, catalyse, and contextualise. In short its the place to come for inspiration, no matter what your discipline. The Inspiratorium is designed as an exhibition – I will need about 60+ metres of wall space – and it will also appear as a blog, a series of ebooks and pdfs, several films, and eventually in print. For the exhibition, individual plaques are printed A5, A4, A3, A2 on gloss-finish archive paper, and are mounted with A4-size LCD screens showing film-clips and other a/v media, as well as projected films related to The Inspiritorium. It is designed to be an immersive and chronological guide or back-story of the media-arts-innovation environment/ecology we find ourselves in our multimedia, networked, computer-mediated 21st century. Its the back-story of our times. When exhibited, I envisage about 1000 discrete artefacts displayed as individual plaques. LCD screens, projections, that are arranged chronologically. The Inspiratorium also encourages participation – visitors can suggest artefacts for inclusion. The Heroes of the Inspiratorium: In these web-pages I refer to several hundred great innovators in the form and the content of new media, but there are at least these 23 individuals whose work played a vital role in modern media – these were and are the architects of 21st century media. You should find out about all of them. 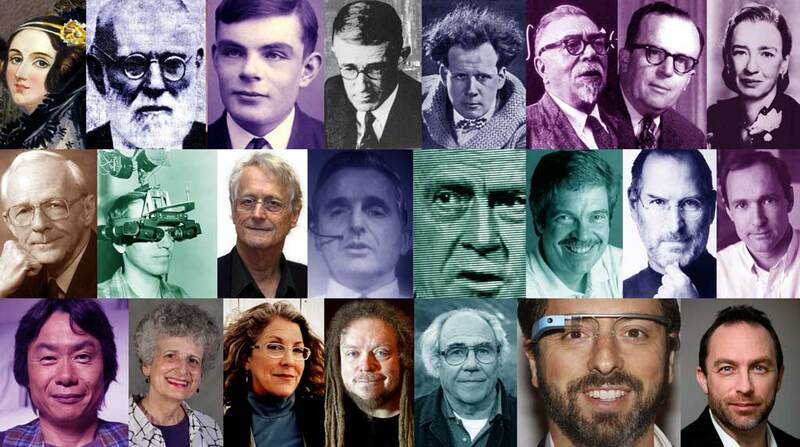 From top left: Ada, Countess Lovelace; Paul Otlet; Alan Turing; Vannevar Bush; Sergei Eisenstein; Norbert Weiner; Joseph (JCR) Licklider; Grace Hopper; Jay Forrester; Ivan Sutherland; Ted Nelson; Douglas Engelbart; Marshall McLuhan; Alan Kay; Steve Jobs; Tim Berners Lee; Shigeru Miyamoto; Janet Murray; Brenda Laurel; Jaron Lanier; Jean Baudrillard; Sergei Brin; Jimmy Wales. Take a look at Zeiteye – a 10 minute animated race through my database. Made in 2010. This pdf sampler features 220+ samples from the entire Inspiritorium – currently over 500 plaques from 1800-2016. 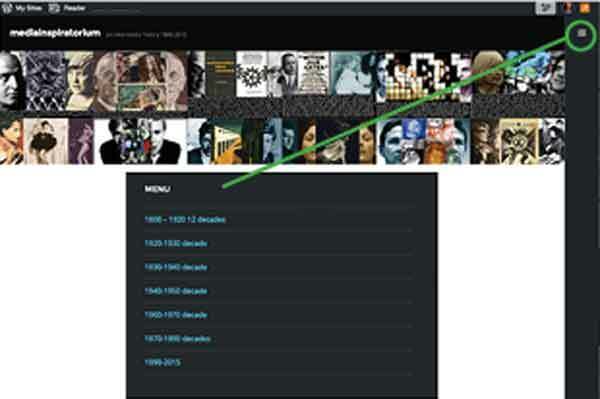 This is currently the most complete online version of my basic database (as of 2016 measuring over 2000 entries), and currently comprises some 600 entries spanning media-art-innovations from 1800-2016.